Udyr gains 15 / 20 / 25 / 30 / 35 % increased movement speed and ignores unit collision for 2 / 2.25 / 2.5 / 2.75 / 3 seconds. Udyr dashes slightly forward when attacking a target while the buff is still active, and only when he stuns the target. While in Bear Stance, Udyr's basic attacks stun the target for 1 second. This effect cannot occur on the same target for 6 seconds. 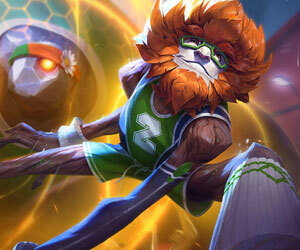 The mana cost of this ability decreases with Udyr's level, down to 28 mana at level 18. And gives a free phantom dancer effect. 1046266 Tasaro And gives a free phantom dancer effect. Full agree. Useful, because can give low stun, allow to move fast. 516937 TwitcherBrain [quote=ExamplePrime] Nice stance on Udyr for starting a fight and running away Also nice for leaving the base quickly off the healing stand [/quote] Full agree. Useful, because can give low stun, allow to move fast.